"Alda's is one of the few soprano voices which the acoustic recording process, to my ears, does not rob of its roundness and warmth, so that her technical prowess can be admired alongside, not despite, the sheer beauty and naturalness of the sound. With Alda, a Marchesi pupil, the great strength is the linking of the registers. Listening to these recordings, I cannot detect the place where chest and middle voice meet. The sweeping phrases of Mathilde's aria have rarely been better embraced on record (and I would venture to say that there is no more perfect trill)." "Because I am currently preparing a biography of this most feisty of sopranos, I was highly delighted when the editor asked me to review [the above] two CDs. 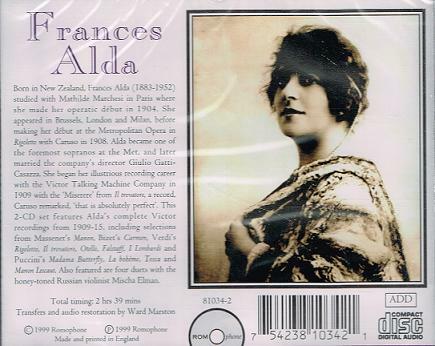 I have long felt that Frances Alda's recorded legacy deserved greater attention. The sonic quality is excellent. The skill with which the transfers have been made allows the listener to relish the warmth and clarity of Alda's singing to the full. These recordings were made when her voice was at its freshest, and it is a treat to hear such firmness of tone and elegance of line. Lovers of fine singing who are unfamiliar with Alda's output will surely be impressed by her musicianship. Definitely a set worth adding to any collection." "Frances Alda was one of the main lyric sopranos of her day, with a voice that could also encompass the occasional spinto role, such as Boito's Margherita and Verdi's Desdemona. She came from a musical family and started her stage career as a light opera performer when she was 18, but soon realized, encouraged by her aunt Frances Saville (herself a celebrated opera singer), that serious opera would provide better career opportunities. She went to Paris, where she studied with Marchesi and, in 1904, made her opera debut as Manon at the Opera-Comique. Her career expanded with debuts throughout Europe; in 1908, she made her Met debut as Gilda in Verdi's RIGOLETTO, where she was to become the reigning lyric. She created the soprano leads of Damrosch's CYRANO DE BERGERAC, Herbert's MADELEINE, and Hadley's CLEOPATRA'S NIGHT. In 1910, she married Met manager Giulio Gatti-Casazza; the marriage lasted until 1928. 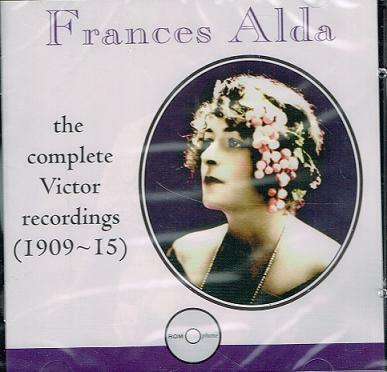 Alda retired in 1929 and published her memoirs, MEN, WOMEN, AND TENORS, in 1937."